At the beginning of the 1990s, there was a major boom on the comic book market. This drew in new publishers, who wanted to compete with Marvel, DC or brand new star Image. 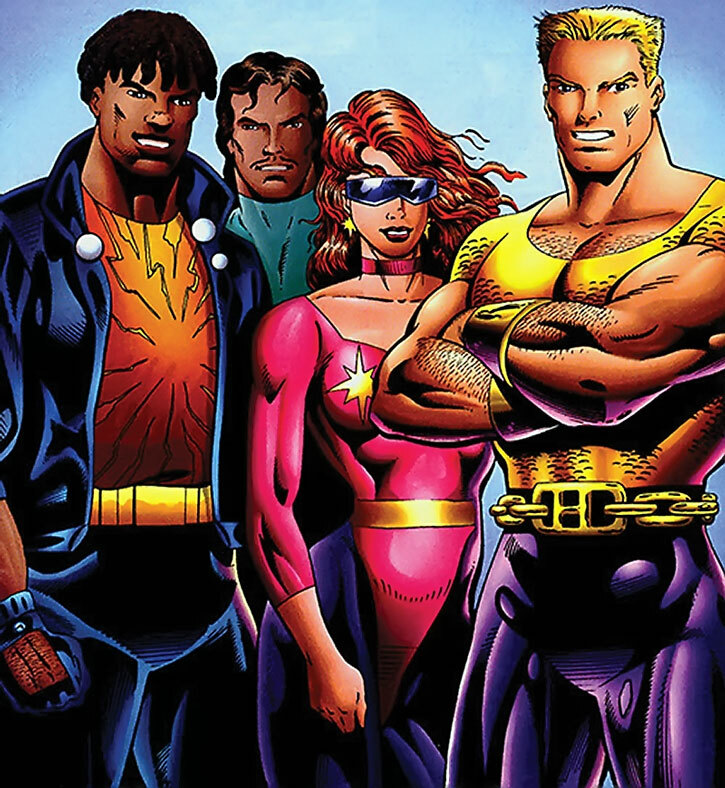 One interesting project was the Ultraverse, which launched in June of 1993. Malibu Comics had been around for some years, but a financial windfall led to their big, big Ultraverse project. A whole new super-hero universe was scripted out and documented by senior comic book writers and Larry Niven . It would be more coherent than its predecessors, and make use of some more modern themes. The money also allowed for extravaganzas such as big ad campaigns, video games, live-action short movies, etc. In late 1994, the Ultraverse was sold to Marvel Comics. Marvel promptly started burying it – and then the comic book speculative bubble exploded. The party was over, and the Ultraverse was essentially gone. 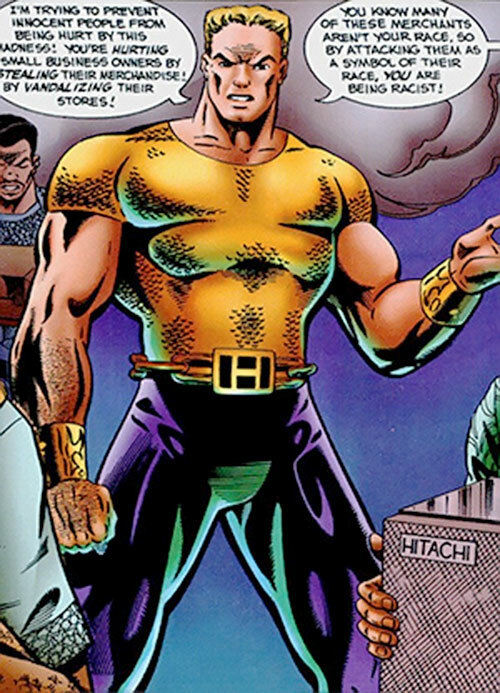 Hardcase was one of the major characters in the setting, and would come to lead Ultraforce (an equivalent of the Avengers or JLA). Written by James Hudnall, he was part of the core titles launches at the creation of the Ultraverse and popped up in a number of crossovers. His main hook was that he was a D-list, self-absorbed actor chasing fame and money. 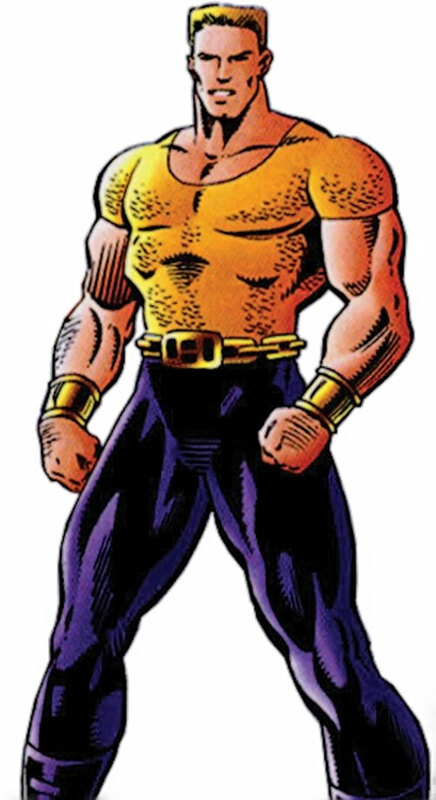 But as fate hammered him hard and his power drew various sorts of unwelcome attention, he was forced to grow and evolve as a man to become an actual hero and eventually a capable leader. 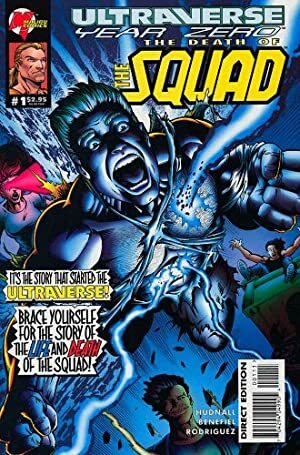 Hardcase chapter 1 – The Squad. Hardcase chapter 2 – Growing pains. Hardcase chapter 3 – Hero. Base Of Operations: Los Angeles. The Squad eventually opened a large headquarters in Century City. Height: 6’3” Weight: 240 lbs. The Squad members seemed to have just one power. Hardcase’s seemed to be super-strength, with proportional durability making him bulletproof. The actual properties of his powers only surfaced much later. One of Hardcase’s most impressive abilities is to make gigantic jumps, thanks to the massive strength of his legs. He trained a lot, and could jump and land with excellent accuracy even early on. Tom Hawke was one of those actor wannabes who populate L.A. and Hollywood. He made ends meet with jobs such as pizza delivery, and attended every audition he learned of. It was during one such audition that he was suddenly struck by a form of blue energy. It turned him into a tall, ripped and handsome ultra-human. Hawke was thought by almost everyone, including himself, to be the first ultra to ever appear. That was not true : the appearance of ultras is cyclical in nature. Those cycles were created by an alien artefact on the Moon. This machine had been desperately attempting to return to its home dimension for centuries. It was sending bursts of energies Earthward in an attempt to create something that could reach it on the Moon and help it return home. During the early 1990s, those waves of energy would grow much more frequent and far more intense. The first big one created Hardcase and others. The reason why most people thought Hardcase was the only superhuman was, sadly, simple. All other ultras were either very well hidden or very much dead. That was the policy of an ancient entity, apparently the first ultra-human, going by Rex Mundi. Whenever a lunar wave of energy would hit Earth, Mundi would have every emerging ultra hunted down and killed. His favourite weapon was a robot named NM-E. It killed hundreds over the years. NM-E was again unleashed after the wave that created Hardcase, but this time it would take months. That wave had created far more ultras than ever before. Meanwhile, the newly superhuman Tom Hawke immediately monetised his abilities by starring in car commercials. But Hawke reasoned he was probably not alone in having received super-powers, and had a plan. By carefully reading the press, he located and met three other persons in the L.A. area who had also been hit by the blue energy. His idea was that they should band together in order to better manage media coverage, contracts and revenues. Hawke got the idea after looking at super-heroes comic books. But what he mostly wanted was to maximise the income from his 15 minutes of fame. The others agreed, and the Squad was born, under the management of Hawke’s agent. Squad member Jamal Blass (aka DJ Blast) got into trouble with a local gang. But the Squad members had been training with their powers in the desert outside of L.A., growing more confident. As a result, DJ Blast and Forsa (Carlos Jiminez) convinced Hardcase and Starburst (Linda Warren) to confront the gang. Warren made the others swear they’d never hurt or maim a human being. The confrontation was successful despite the gang taking hostages, and ended without anybody dead or excessive force. The Squad members were arrested. But a deal was struck and they contracted out to the City of Los Angeles as super-heroes of a sort. Though they mostly did PR work, they also violently clashed with more street gangs. They were generally successful in the latter, though they also knew some failures. The Squad occasionally intervened in difficult situations such as hostage crises and raids on fortified crack houses. But that always was under heavy LAPD supervision. Even the LAPD, though, came to appreciate the usefulness of the Squad in arresting armed suspects without casualties. The bulletproof Hardcase was a fantastic point man. Hardcase and Starburst fell very much in love early during the Squad’s career. They soon started a relationship with an unusually strong chemistry. Their true test came in 1992, during the massive riots that followed the acquittal of the police officers who had beaten Rodney King . Though the municipality would have preferred them to stay put, the Squad took to the streets to minimise injuries and looting as they could. The Squad was then at the height of its success. It was highly popular, especially among youths. They had received extensive media coverage ever since the deal with the City of L.A., and were household names. Correspondingly, tabloids started running highly lurid stories about them. These included outrageous lies from Starburst’s ex. The Squad considered moving up and dropping the contract with the City of L.A.. While most members did not want to work with the Federal government, there was a sense that they should take a stronger stance and help more people. DJ Blast and Forsa being wary of government agencies, the Squad turned down an offer from special law enforcement agency Aladdin. But days later the Squad proved their mettle by stopping terrorists holding schoolchildren hostages. Not a single person was shot. However, NM-E was closing in. The Squad were still popularly thought to be the only ultra-humans around at that point. But the cops found the butchered corpses of other ultra-humans, and pieced their stories together. The police warned the Squad that there was some sort of serial killer of ultra-humans around. When NM-E attacked, the foursome where attending a housewarming party thrown by Squad member Forsa. The house was packed. NM-E’s attack was a massacre, killing 15 before the Squad could react. Nobody was prepared for this, and NM-E performed admirably. It clobbered Hardcase, put Starburst into a permanent coma, cleft Forsa in two and gutted DJ Blast with chaingun fire. Fatally wounded, DJ Blast told Hardcase to grab Starburst and jump away. He then dragged himself to NM-E’s feet and turned his power inward, detonating himself. The explosion was monumental, and blew even the near-indestructible NM-E to bits. The Squad had stopped NM-E. This ensured that for the first time in millennia, a new generation of ultras could emerge without being quickly slaughtered by Rex Mundi. Hardcase, shellshocked by the carnage, retired his nascent career as a super-hero. He decided to resume being just an actor. The costume in the illustrations was Hardcase’s first. He wore it for his entire Squad career. Tom Hawke is at this stage a normal, everyday guy. But he has an altruistic, dynamic streak. Yes, he might be a bit mediocre, not cut for deadly crises, and chiefly interested in money and fame. But he still wishes to do something for his fellow man. To him, his powers are not just a way toward fame and fortune. They are *mostly* that, but also an actual chance to do something good. Hardcase is, at this point, still naïve and inexperienced. He wants to sound like a super-hero, but it usually comes across as forced and awkward. His training as an actor doesn’t help that much. Though he means well (as long as he gets money and his face on TV) he’s certainly not a natural. During the career of the Squad, Hawke was exposed to a lot of misery. For instance he read letters sent by people begging for the Squad’s help, which often described awful situations. This in turn started pushing him toward being a super-hero. Yet he was unsure of how well that worked in complex situations, such as a man beating his wife and children. Hardcase was genuinely in love with Starburst. Her permanent coma was one of the great tragedies of his life, and he spent years working through his crushing grief. Hollywood (Low), LAPD (Low), Squad (High). – Super Athletic — Leaping 9, Enhanced Dodge 6, Enhanced Parry 5, Enhanced Close Combat: Unarmed 5. – Powerful — Enhanced Strength 10, Enhanced Stamina 10, Impervious Toughness 10, Enhanced Advantages (All-out Attack, Power Attack). Close Combat: Unarmed 0 (+8), Deception 3 (+4), Expertise: Acting 2 (+4), Insight 3 (+4), Perception 4 (+5), Persuasion 1 (+2), Vehicles 4 (+5, Limited to land vehicles, -2). Doing Good Hardcase helps others in need and wants to make the world a better place. Limelight As the first public ultra, Hardcase’s every move is scrutinized. His desire for success and fame make him susceptible to this attention. Identity Hardcase’s civilian identity of Tom Hawke is public knowledge. Hard Luck Hardcase is especially prone to bad runs of luck. The GM should feel free to introduce a Complication from time to time when things seem to be doing too well. Trade-off areas. Attack/Effect PL 10, Dodge/Toughness PL 10, Parry/Toughness PL 10, Fort/Will PL 8. Points total 115 . Abilities 28, Defences 3, Skills 7, Powers 75, Devices 0, Advantages 2. Equiv. PL 8. Helper(s): Darci, Capita_Senyera. DCH stats by Pawsplay.